See the whitish line halfway up the concrete foundation? That is where the grade used to be. For months the house has felt partially buried; now things are starting to feel "right". The machines roar, dirt moves, and close calls between machine and house make my blood pressure rise. The potential for destruction is high, but so far just 2 small-ish dings that I consider getting off light. Entropy, as mentioned before. It is easier on me to work inside (still painting!) than to watch. 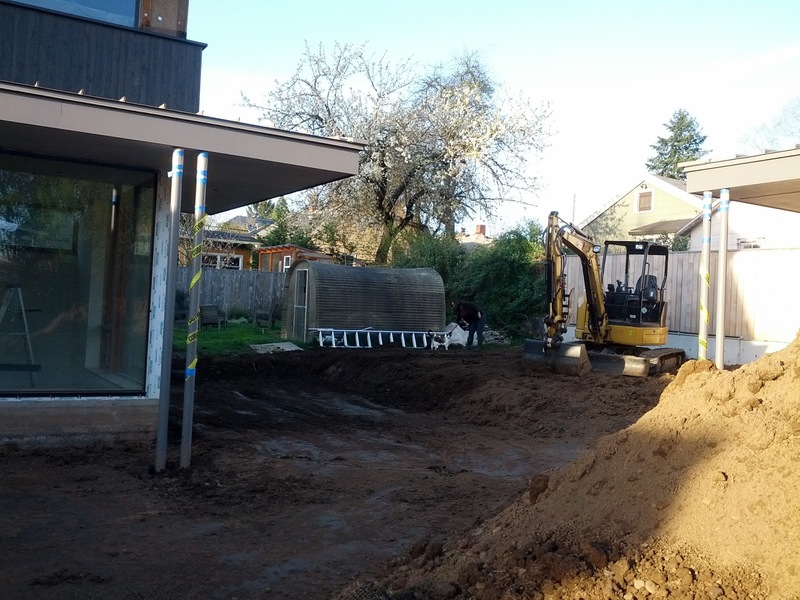 The driveway is the big challenge of the site. It is going to be steep, regardless. The higher on the site we positioned the house, the steeper the driveway. A perfectly flat site would be an easy decision, but our site rose deceptively toward the north and east. We opted to position the house lower, and to adjust the grade around the house a bit more. A decision that results in quite few dump-truck loads. 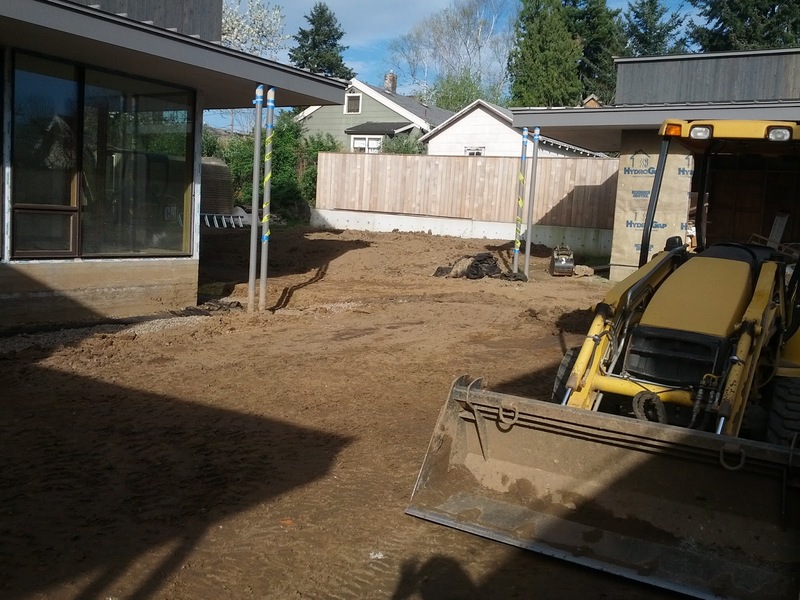 While it made sense to us that this work would occur first thing prior to foundation work, the excavator opted to do about half of it then, and leave the other half for later. This has caused us no end of hand-ringing during the winter rains. But we have finally gotten them back to finish, and our relief is significant. The back of the site steps up a good bit; this is where the vegetable garden will be. A low board-formed concrete wall was originally planned at the transition point. This will have to wait for more flush times. Note the girl and the cat. A bit of a grade step at the north property line (straight ahead), and to the right where the site wall one day (?) will be. 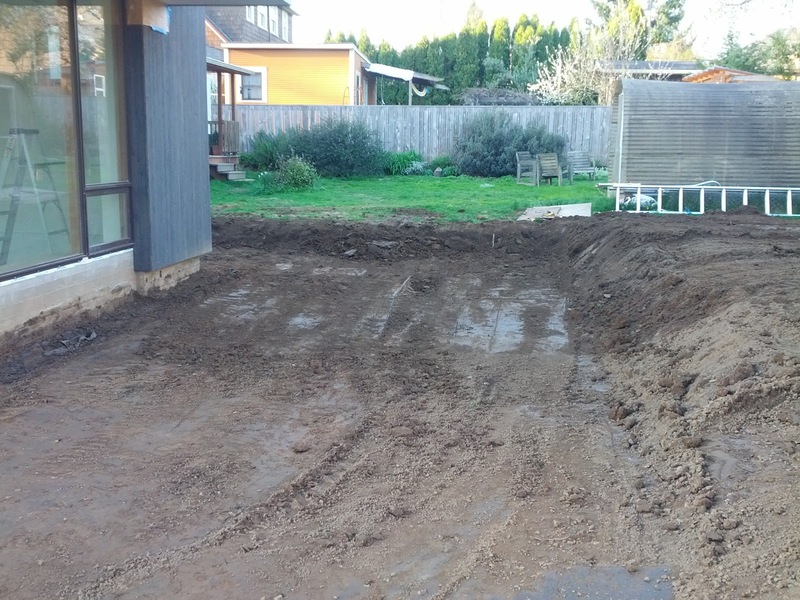 In this area we will have a nice clean rectangle of lawn..